Website popups, or site overlays, are a highly contested subject, although it shouldn’t be. 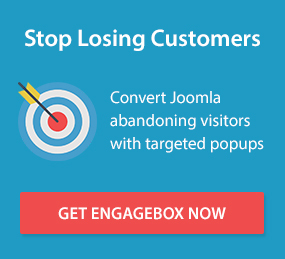 With the average website seeing 98% of its traffic bounce, there aren’t many reasons not to use an exit-intent popup. Here are the 5 of the best practices for exit-intent popups and awesome lead generation. What do your first time visitors want? How are they getting to your site? Are they clicking on anything? These are all important questions that must be answered if you are going to create an exit-intent popup that actually converts at a high rate. By analyzing the user behavior you not only get insights into what may or may not be working, you can also use this to discover what customers want or what catches their attention. Use that information to create your popups, whether it be in your copy or as useful information in creating an offer that people want. “I hate popups”, “those popups drive me crazy”, and other similar statements are made when the design of the popup being used is just plain bad. In an attempt to get people’s attention, marketers have created popups that miss hitting the nail on the head. In short, your popup should blend into the site’s theme, and should not stand out awkwardly (that’s what leads to such disdain for popups in general). The average attention span is 8.25 seconds. That is not a lot of time, but it is definitely enough time to get people’s attention. This does require that you cut down on the amount of text you want to use. When it comes to utilizing the right amount of text, this exit-intent popup from Amaura Jewelry is a great example. This is a prime example of how a small amount of text can do more than a large amount of text, “Stay and get 10% off for your purchase”. I might have removed the word “for”, but all in all the text is right on the spot, and forgoes adding meaningless adjectives. No matter what your business does – whether just blogging, eCommerce, or a digital service – you’ve got to be able to offer something to visitors. Optimized exit-intent popups offer both the website and the visitor something new. As a business, you generate more leads. As a new lead in a business funnel, the visitor should receive something in return. Even if you create a perfectly branded popup with an eye-catching headline and a great offer, if the call to action is not fitting, your popup won’t bring optimal results. Going back to Mistobox, they not only rock a great offer, but also pair the offer with the right call to action. Instead of adding “sign up,” “join,” or some variation, they’ve used “pick me” which falls in line perfectly with the offer. For those of you that are sold on implementing an exit-intent popup (should be all of you), make sure you pick a service that is right for you! Not all exit-intent popups are created equally (and in this case that is good). I’d love to hear what you’ve got to say on the subject – whether you agree or disagree on any of the points.